Shane always let me follow him around. He never complained or told on me for bothering him but he hardly acknowledged me either. He wouldn’t ask, “Hey do you want to go shoot bullfrogs?” He would just take off for the pond with his bb gun and I would traipse after him like a puppy asking him questions all the way. His responses were usually of the one word variety and mostly he would shush me because we were always stalking some sort of wild life. Shane would suddenly freeze and I knew to follow suit. 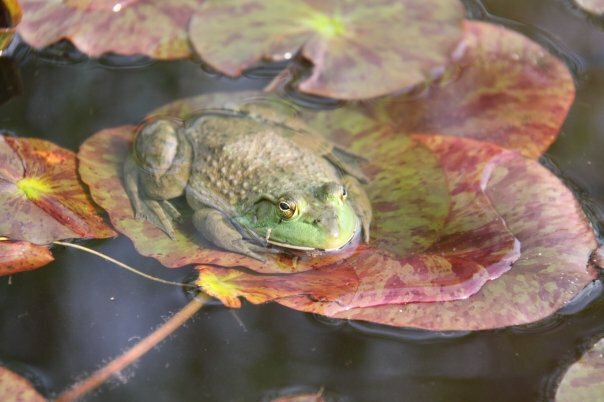 He would pull that BB gun up to his eye and ping, the BB would splash off the surface of the pond and startle some old bullfrog off the bank and into the cold green water. The pond wasn’t like a postcard body of water. It was murky and dark and surrounded by a high bank covered in cattails and weeds and tall grasses and blackberry brambles. There were a couple overgrown weeping willows dripping leaves into the pond and the sound of buzzing insects was constant. There were snakes. I know there were. We seldom saw them but when we did, I usually ran the other way. I loved watching the dragonflies. There were two kinds, the big thick meaty ones that looked like Blackhawk helicopters hovering in the weeds and the tiny thin ones we called snake doctors. The snake doctors were the pretty ones. They were the most amazing and surreal colors. My favorites were the aqua blue ones and the teal green ones. They seemed like creatures from a fairy tale. I guess that’s why I liked following Shane around. I didn’t care that he didn’t talk much or that he was killing frogs which I actually thought was kind of gross. I just liked being out by the pond and I wouldn’t dare go out there by myself. Following Shane brought me to the fantasy land where beautiful metallic-toned snake doctors lived their lives among the reeds and the willows. Within Shane’s quiet company I imagined life as an insect humming over the muck. The frog hunted by Shane became the hunter for my snake doctor. Hovering too close, the beautiful but fragile creature disappeared silently into the jar mouth of the fat lazy bullfrog. The frog, sensing the stealthy hunter above, plopped from the bank to disappear himself into that dark water.